Dr. Alfred Ching has certainly earned the right to retire. Since graduating from the University of Michigan Medical School in 1952, he has spent more than half a century working as a child and adolescent psychiatrist. The idea of giving up his practice is something Dr. Ching has never really given much thought to, however. In fact, it wasn’t until last spring, after he suffered a debilitating stroke, that the 90-year-old Valrico resident first slowed down a bit. “Prior to that, I had shifted to locum tenens, where you go around to different places and fill in for physicians that are away for a time,” Dr. Ching explains. “Before that, I was the director of the children’s psychiatric program at the Tampa Bay Academy. The stroke, which hit right after supper one night, came in the wake of a couple of scares in which Dr. Ching, who has atrial fibrillation, had what he refers to as “a couple of mini strokes.” After each of those, he was back on his feet within a day. That wasn’t the case with his latest stroke. This one left him with no control over his left leg, arm and hand, and required Dr. Ching to be flown via medevac to the Tampa Bay Heart Institute at Northside Hospital in St. Petersburg, where he spent three days. 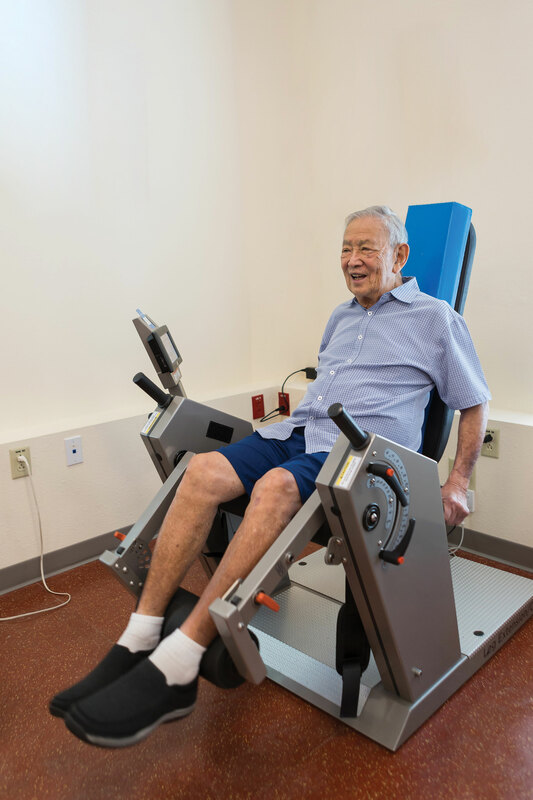 That brief stay at Northside was just the beginning, however, of a long journey back to functionality in which most every step Dr. Ching has taken has been at Hawthorne Health and Rehab at Hawthorne Village of Brandon. Located just east of Tampa, Hawthorne Village of Brandon is a not-for-profit, full-service retirement community composed of three separate facilities, each of which specializes in its own specific aspect of carefree retirement living. For those wishing for maximum independence and privacy, The Estates offers seniors the opportunity to live an active and independent lifestyle in an exquisite apartment home nestled inside a carefree, amenity-filled setting. Finally, for seniors recovering from a major illness or trauma, Hawthorne Village offers skilled nursing care for inpatients through its Bounce Back® program, which is designed to relieve pain and restore the function and mobility the resident needs to return home. The same physical, occupational and speech therapies offered in the Bounce Back program are also available on an outpatient basis at Hawthorne Village, where a team of experienced therapists has been trained specifically in the art of rehabbing older adults. 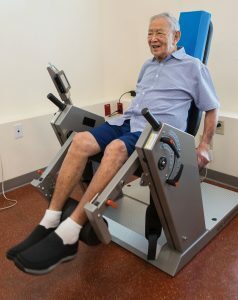 For inpatients and outpatients alike, all of Hawthorne Village’s rehabilitative care is provided inside AJ’s Fitness Center, an on-campus facility where custom programs using state-of-the-art equipment are designed to help all patients attain optimum levels of function. Dr. Ching has come to know his way around Bounce Back Rehab rather well as he has spent the past year rehabilitating there, first as an inpatient, then as an outpatient and now as a visitor three times a week at AJ’s Fitness for continued physical and occupational rehabilitation. “When Dr. Ching first came here, he needed what we call maximum assistance, which means he needed a therapist to provide seventy-five to one hundred percent of the effort required to do most things,” explains Kelly Greer, Director of Rehabilitation at Hawthorne Health and Rehab. “At that time, Dr. Ching could not even stand up. He could not go from a lying-down position to a sitting position without the help of a therapist, and so he obviously could not walk, which is why he came to us as an inpatient. “He just didn’t have the strength or the postural or trunk control to do those things on his own. In addition, his left shoulder range was very limited, and he didn’t have the fine motor skills to pick things up with his left hand and move them with his arm. Dr. Ching was at the lowest level of functionality when he first arrived at Hawthorne Village. As a result, he needed an even 100 days to reach the point where he was able to function safely at home. When he reached that point, he was released. 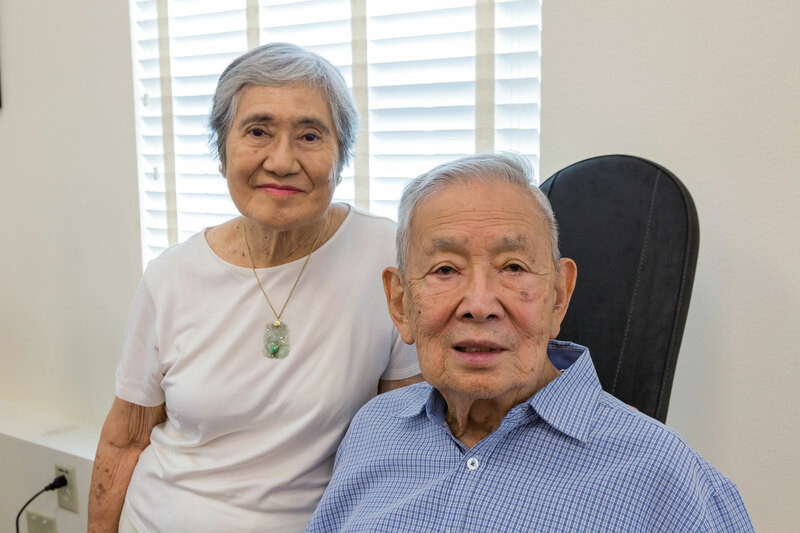 Dr. Ching then spent a month doing prescribed health therapy at home, after which he returned to Hawthorne Village on an outpatient basis, rehabbing five days a week for four months. For patients such as Dr. Ching, Kelly says it’s best that they continue therapy on an outpatient basis. The decision to return for outpatient therapy has proved invaluable for Dr. Ching. Though he still uses a walker at times, he can now walk with only a cane and is confident he will soon walk without any assistance at all. He has also regained a lot of the mobility he lost in his arm and hand, enough that he no longer needs help bathing or dressing himself. He continues to visit AJ’s Fitness Center three times a week, primarily for cardiovascular and leg strengthening. “He’s always been very independent, and he’s getting a lot of that independence back now,” says Dr. Ching’s wife, Kiyo. “He’s able to get around a lot more now, so we’re taking daily walks around the neighborhood again and going to the grocery store together. “He sometimes uses those carts they have for people who are disabled when we go to the store, but mostly he uses his walker. He’s really made great progress since he arrived at Hawthorne Health and Rehab, and a lot of that is due to the people they have here.